Best China Tour with Lhasa: you will tour all the highlights and learn culture of Shanghai,chengdu,lhasa,xian,beijing. This tour includes our capital city Beijing and historic city Xi’an. Both of them have been the ancient capitals of our country, and nowadays they are two cities with profound historical and cultural heritage. Reputed as the land of abundance, Chengdu deserves your exploration as this area includes the most beautiful mountain scenery under heaven, and also it is the hometown of lovely giant pandas. Travelers may linger their stay here once stepping on this wonderful place. Tibet is one of the most mystical and spiritually holy places on earth. Explore this sacred land and visit the majestic Potala Palace, where you will also meet the hospitable Tibetan people with their unique folk customs. Today your memorable tour start! 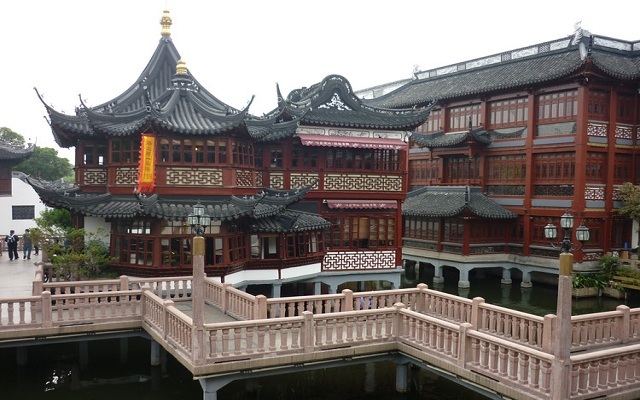 The first stop of your trip is the well-known Yuyuan Garden, the representative ancient garden in Shanghai. Here you have about 1.5 hours to enjoy the elegant pavilions, villa, lotus pond and bridges in the 400-year-old garden and visit the two highlights Mid-Lake Pavilion and Zigzag Bridge that make access to the Pavilion.Out from Yuyuan Garden and you can move to the nearby Yuyuan Market to explore how elaborate and cute the traditional Chinese handicrafts and art works are. Continue your tour to Xintiandias, which is considered one of the first lifestyle centers in China. The district is composed of an area of reconstituted traditional mid-19th century stone gate houses on narrow alleys, some adjoining houses which now serve as book stores, cafes and restaurants, and shopping malls, and romantic settings can be seen everywhere. Today you will visit the Bund, on which you can embrace the best cityscape, feast on the rich architectural fashions (Gothic, Baroque, Rome, Renaissance, Classic and Mixed Eastern and Western style, etc.) and know why Shanghai is glorified as "Paris of the East". After lunch at a great local restaurant, we will drive you to Pudong International Airport for your flight to Chengdu. Upon arrival, our guide will pick you up at the exit of the airport with a welcome signage. And after a simple dinner at the local Chinese restaurant, drive you bck to the hotel immediately. Then our guide will take you to try the local delicious cuisine for dinner and you will be taken back to your hotel. Then head to Norbulingka Park is considered the premier park of all such horticultural parks in similar ethnic settings in Tibet. During the summer and autumn months, the parks in Tibet, including the Norbulinga, become hubs of entertainment with dancing, singing, music and festivities. Today After breakfast, our guide will take you to see the magnificent Potala Palace, the former winter palace of the Dalai Lama. There are vast and awe-inspiring maze of corridors and stairs leading to countless rooms，which are richly decorated with statues, tombs, murals and antiques. Climb past the White Palace into the Red Palace, where the file of pilgrims offering silk scarves, coins or yak butter to burn in the shrines. Pay attention that you need to be in good health for the climb up the long stairways. Finally, our guide will take you to the local Chinese restaurant for dinner and drive you back to your hotel. After breakfast, you will visit the Yangpachen. The town of Yangpachen lies in an upland lush green valley surrounded by the tents of nomads with grazing yak and sheep populating the hillside. The area is famous for the hot springs, which have been harnessed to produce much of the electricity for the capital Lhasa. After finished the tour in Yangpachen, take you to a local restaruant for lunch. After lunch at a local Chinese restaurant, you will head to a significant pagoda in the city of Xi'an-The Big Wild Goose Pagoda. The pagoda has a brick frame built around a hollow interior, and its square base and shape reflect the building style of other pagodas from the era. As part of the artistic heritage of Buddhist architectures of the Tang Dynasty, it is witness as to how Buddhism was introduced to China and integrated with the culture of Han nationality. Then you have a chance to appreciate the Tang Dynasty Show, which is a wonderful performance of the ancient music and dance. Over thousands of years, the dances developed from a few simple postures or gestures to become delicate and reaching a peak artistically during the Tang Dynasty. Then, drive you to the Beijing International airport directly and your wonderful 13-day-tour ends. Hope you a pleasant trip!